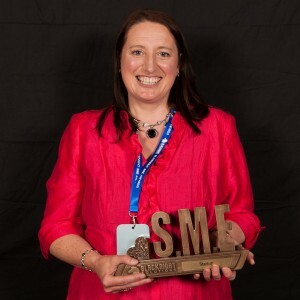 Fermoy-based company Themis Food Advisory won the Best Start-up category award at the 2015 Blacknight SME (Small & Medium sized Enterprise) Awards on 25 April at the Radisson Hotel in Cork. This inaugural event recognized the hard work and ingenuity of Irish SMEs from across the country and was contested by over 100 SME finalist companies in 14 different categories. The SME Awards were hosted by RTÉ’s Rick O’Shea. Presenting the awards, CEO of event sponsors Blacknight, Michele Neylon paid tribute to the work of the unsung heroes in SMEs who drive the economy and support local employment. 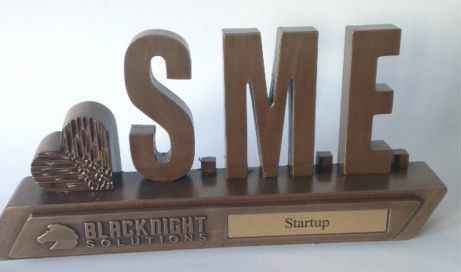 “As a successful indigenous SME, Blacknight is proud to support the business community and celebrate its achievements”, he said. Relatively young and innovative startups were side by side with long established firms at Saturday’s event. The Startup category was won by Themis Food Advisory (TFA), an International food regulation advisory company founded by UCC graduate Dr. Karen Roche in 2014. Competition in this category was stiff with a total of 25 contenders being eventually whittled down to 10 finalists. TFA (www.themisfoodadvisory.com) was also shortlisted for Best New Product or Service from a SME. Commenting on her company’s success at the awards, Themis Food Advisory founder and CEO Karen Roche said “This is a wonderful way to celebrate our first anniversary in business and I would like to take this opportunity to thank all those who believed in and supported our vision from the outset-most especially our clients, the North & West Cork Local Enterprise Office, Avondhu Blackwater Partnership Ltd and the Department of Social Protection. This award will help us to achieve greater recognition for the type and quality of services we offer and will hopefully enable us to expand our client base nationally and internationally”. TFA provides regulation-monitoring and compliance gap-analysis services to food, feed, beverage, nutrition and ingredient companies enabling them to minimise time-to-compliance with regulations governing existing and new markets, new product introductions, health claims and consumer acceptance. While the food industry is currently experiencing unprecedented growth and positive prospects, it faces increasing challenges with respect to regulatory compliance. Many food companies, large and small, lack sufficient in-house expertise to keep abreast of developments in food regulation and to engage confidently and effectively with the regulatory authorities. This can result in failure to translate innovation investment into competitive strength, growth and profit. TFA addresses this skills and service gap. TFA has four main target markets: food, feed & beverage production & processing, food/nutrition product development, novel ingredients and food & beverage import/export. Target customers include domestic and export-oriented food businesses, retailers and independent food service operators.